55 hours in Bologna isn’t much, but you can still see a lot of the city in about two days. These are the most important things to do in Bologna if you only have a long weekend to explore. As you know, from previous posts, I love Italy and keep traveling there again and again. Bologna was the most recent Italian destination I visited. My 55 hours in Bologna began with a short bus ride from the airport to the Airbnb which was located right in the city center. Our flight had arrived very early, but our host was kind enough to let us check in right away. After checking in we only grabbed a quick vegan breakfast before going back to sleep for a bit. After we woke up we decided to take a stroll through the city center. The red, orange, and yellow tones of the buildings were an unmistakable reminder that we were once again in Italy. As Bologna’s Old Town is fairly small it’s possible to get around entirely on foot. 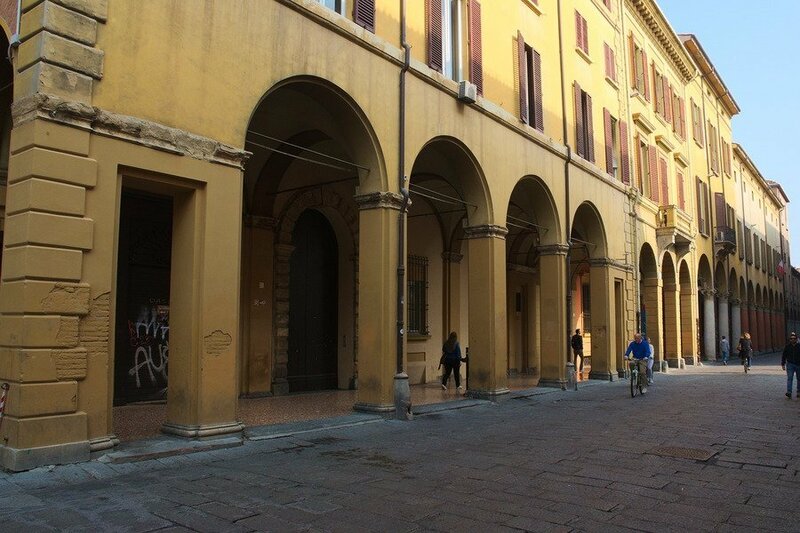 What was different from other Italian cities was that there were porticoes everywhere. It didn’t rain during our long weekend in Bologna, but even if you find yourself here in the rain these arcades will help you stay dry. They make walking around Bologna so inviting. In Bologna, you see people out and about a lot, from their way to work, to their lunch breaks and romantic walks after dark. The combination of the colorful buildings and unique porticoes is why Bologna genuinely stands out from other Italian cities I have visited. It’s the red rooftops that led to Bologna being nicknamed La Rossa (the red one). Its other nicknames are La Dotta (the educated one, for the oldest European university) and La Grassa (the fat one, as it’s known in Italy for its extraordinary cuisine). Bologna is still much less touristy than nearby Florence and Venice, and this made our trip so much more enjoyable. Why You Should Visit Bologna: There Are Lots of Things to Do in La Rossa! To be honest, I didn’t expect to see all that much in Bologna. I found out that there were direct flights from Athens, and sometimes this is the best way to decide where to travel next. I had never considered Bologna before finding this direct connection. It simply hadn’t crossed my mind as opposed to cities like Rome, Milan, Venice, and Florence. I have to admit that I didn’t even know all that much about the city. I knew that it gave its name to the Bologna Process which helped standardize education across Europe, but that was it. The good thing about not knowing much about a place is, of course, that your expectations aren’t too high, and you can’t really get disappointed. So if you wanted to go to Bologna without knowing anything you’d still enjoy it. However, now that I have been there I can tell you some of the reasons that make La Rossa a city worth visiting. First of all, there’s a lot of stuff to do in Bologna. While it’s not a very big city, it does have a significant student population so there are always events and all sorts of cultural happenings. Secondly, as Bologna is also known as La Grassa, you could plan an entire trip around food. While the vegan restaurants were not as spectacular as in other European cities, I have a feeling this may have been due to the fact that a lot of restaurants were closed on the weekend. The main reason to go to Bologna, however, is the beautiful architecture. There are many famous buildings you can visit in the city which all tell an important part of Bologna’s history. I truly believe that just about two days are perfect for La Rossa as it’s enough to see all the main sights but not so much that you might run out of things to do. Without further ado, here are my recommendations for how to spend 55 hours in Bologna, La Rossa. The main thing you have to do in Bologna is go for a walk to marvel at the city’s architecture. You will see the famous towers in the center of the city and various palaces around the main square. The best thing on a weekend is that the city center is closed for traffic on Saturdays and Sundays. That way, you won’t have to mind the cars. Don’t think, however, that this means the streets will be empty. 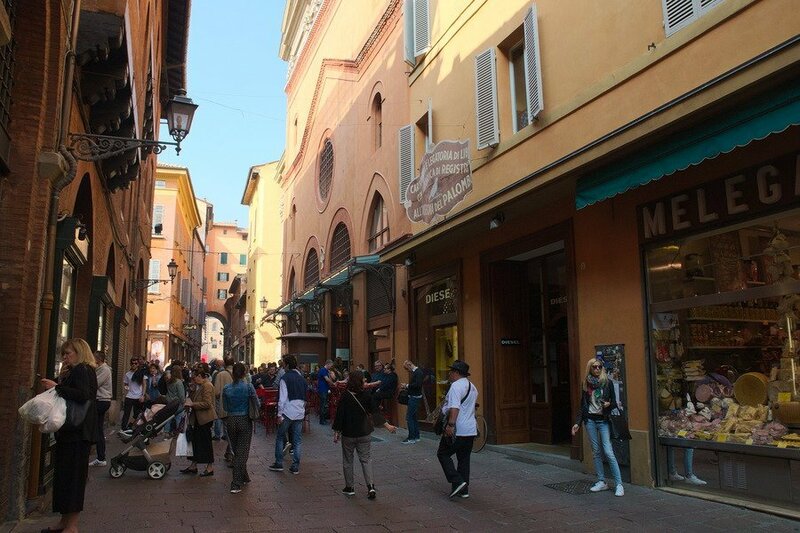 On the contrary, the people of Bologna make use of this pedestrian area, and you will see hundreds of people strolling around. Bologna’s main square is surrounded by interesting architecture: from the Basilica di San Petronio, the Fountain of Neptune, to various palaces. There’s so much to see within steps from the main square. I will put up a vegan travel guide for Bologna soon, but let me say that according to an Italian restaurant ranking of 2017, the best vegan restaurant in all of Italy is right here in Bologna. We also went to a vegetarian restaurant and a place that offers meat, but their vegan options were fantastic. This beautifully decorated building houses various university museum collections on natural history, anatomy, optics, electricity, and other topics. The exhibited pieces give you a glimpse into how these sciences were taught at universities in the past. The entire building is well worth seeing, but you should also get the ticket for the anatomical theater to see where students in the past learned about anatomy while observing how their professors dissected human bodies. Be aware though that it was rebuilt after having been bombarded in 1944 so what you see is not original. This doesn’t make it any less intriguing, however. The neighborhood around the university buildings, in particular, has a lot of street art to offer. 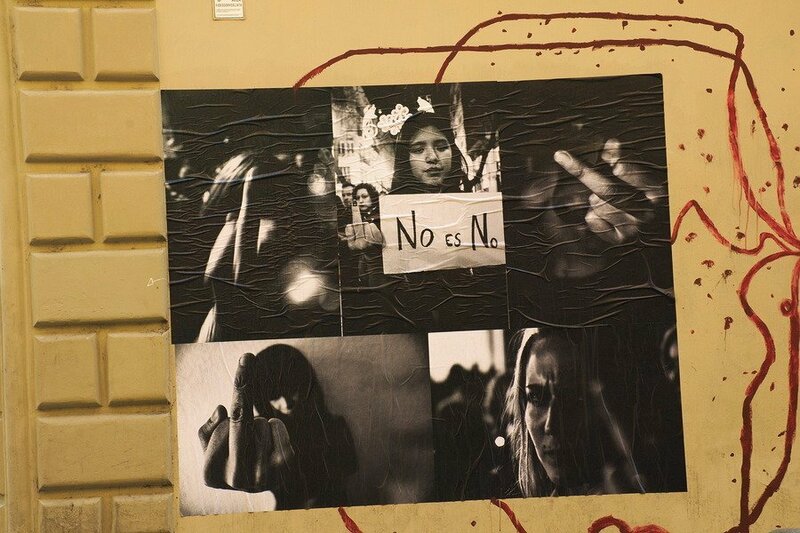 Aside from being full of students, Bologna is also a very left-leaning city so a lot of the street art here is political in nature which is an aspect that has sometimes been forgotten in today’s street art. Trying to find these obscure sights is a great way of walking around the city. In the process, you will pass magnificent streets and beautiful buildings that you might otherwise miss. People love to go shopping in Italy. As the city center is closed off for traffic on the weekends, your shopping experience will be much more relaxed. In my opinion, authentic Italian pasta is always a good (and useful!) souvenir from a trip to Italy. We were fortunate enough to stumble upon a free concert of the Orchestra dei Giovanissimi del Conservatorio di Bologna. Italy is a great destination for the arts, but Bologna, in particular, is an important city if you like music because it is one of the UNESCO Cities of Music which means music has a very high status in the city. While we were there we saw a lot of little concerts on the street. If you only have a weekend you should really consider staying in the city center. It’s close to the airport, and you can reach all interesting things to see and do by walking. We found an Airbnb which was quite cheap for being in the center. If you don’t have an Airbnb account yet, you can use my link www.airbnb.com/c/ninaf3363 to sign up and get a discount on your first booking. You will certainly have a great time if you choose to go to Bologna for a weekend. Although I am not saying that you shouldn’t go during the week. It will still be a wonderful city on other days, but as a student city, it comes to life on the weekend. Don’t take a car. As I mentioned before, cars cannot enter the city center on the weekend, meaning that you will need to walk everywhere regardless of whether or not you have rented a car. Check the opening hours of the things you want to see. If you’re going to be in Bologna for a weekend some museums you want to see may close early. Plan ahead so you get to see everything that interests you before it closes. Whether you’re visiting Bologna on the way to Florence or another Italian city, or are going there just for itself, you will certainly find that La Rossa is worth a visit. There are many things to do in Bologna, and it’s suitable for art buffs, food lovers, and people who want to have fun. Don’t make the mistake of overlooking this quaint Italian city. Have you ever been to Bologna? If not, is this post enough to make you want to go? Thanks for the comment, Jason! You absolutely have to go to Bologna. It’s so underrated. You got so lucky with the weather during your trip…. and doesn’t a little bit of sunshine make all the difference! Yes, the weather was wonderful! Not too warm, but not cold or gray. Italy always spoils me like that. Thank you for the great share and lovely photos! My friend is working in Bologna and always inviting me to visit. As I live in Calabria, it’s an overnight bus and will go when it gets a little warmer. You should definitely go! Spring must also be pretty nice in Bologna from what I imagine. Love this and now as a Vegan, I’m even more tempted. The street art looks beautiful too. *books flight* (Mary).